Wholesale single Atlantic orange lion's paw shells are 5 inches to 5-3/4 inches. These large orange lion's paw scallops are sold in singles. The exterior of this famous large scallop resembles the knobby knuckles of a lion's paw. The Atlantic' lion's paw is popular with shell collectors because of its many beautiful colors and the ornate sculpture produced on the valves. 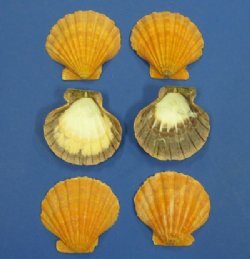 It is a large decorative seashell used in coastal home decorating and seashell decor. Packed 6 pieces. Our shells are commercial grade. You may receive some with chipped edges and natural blemishes.